Bathroom has a shower and toilet with a common sink just outside the bathroom. Herriman City is just 3 miles away. Shopping, dining etc. We wanted to stay somewhere different and this was perfect!! The barndominium was perfect! From pulling up to seeing a cute dog and a cute cat and three and a half horses :-)! Bill and Diane were wonderful hosts! There were some unexpected events with fires that were local and they were very concerned for our safety and took care of us! Wonderful and unique place to stay. I surprised my wife and kids with an overnight stay at the barn and they loved it! The barn is furnished well and is comfortable and cozy. I was surprised there were no barn smells as the animals are so close. Bill and Diane are very nice hosts and came by to talk to us and show our kids the animals. I would absolutely stay again at this one of a kind rental property. Every year I take my mom on a road trip, and we prefer to stay in unusual accommodations. The “Barndominium” fit the bill for the last night of our trip. It is very close to the city, but far enough up the hill that you felt removed from the hustle and bustle. The view of the hillside was lovely, and watching the horses roam around was nice. The barn cat is a big lover, and will expect lots of belly rubs. All amenities are provided, bedding was comfortable as were the oversized leather couches and chairs. Everything was clean, clearly marked and there were several quaint personal touches. We arrived after dark, and my mom who was navigating, sent us to the other side of town...I’m not sure which map app she was using, but when I used my phone and the directions provided it led us straight there, it’s a little tricky to find it when it’s dark out, but trust the directions! I wish we could have stayed longer. The owners were out of town when we stayed, but I was able to communicate with them easily. If I am in the SLC area again, I would definitely stay again! Bardominium was everything I expected and more! I was looking for a getaway completely different from my everyday life. This was a great change! 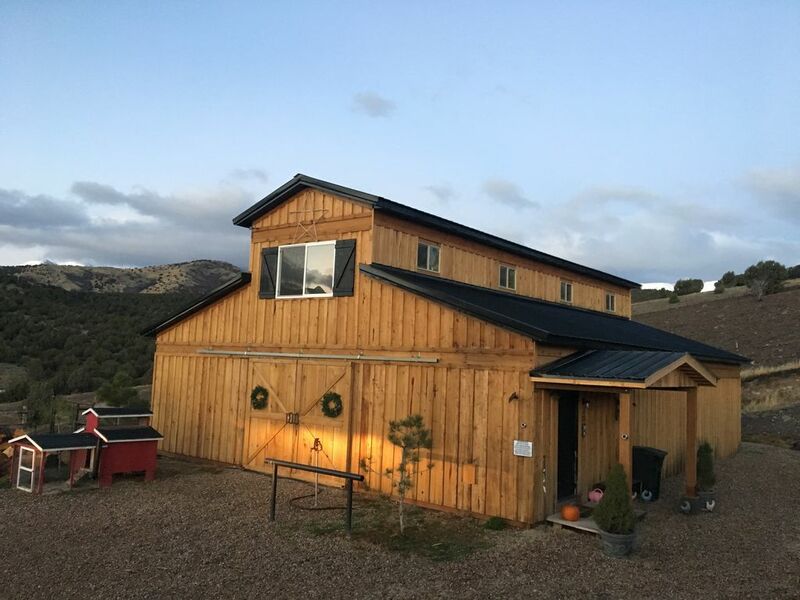 This area of Utah is gorgeous, the barn is new-ish and very comfortable. It was a 6 min drive down the hill to restaurants so not too far into the country. I was a little nervous that there would be a lot of farm noise/farm smell but there was not! There were a couple of nice dogs, a cat, horses, deer, and cows (in the distance). I heard a very strange noise one night when I was outside. It turned out to be one of the horses licking a salt lick and it turned out to be one of my favorite moments. My hosts made some fresh pressed apple cider for themselves and kindly shared some with me. I have never had fresh cider before and it was heaven. I was also concerned that the barn would be cold. Also not the case. There were several adjustable heaters and plenty of warm quilts for the bed. I would be happy to stay again!